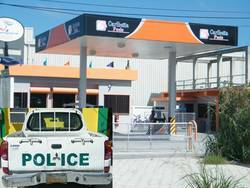 It has been almost three weeks that the sole supplier of vehicular fuel on Ambergris Caye, Caribeña Fuels, has suspended fuel supply to the San Pedro Police Department. The decision was made after the SP Police Department has been running an over-due account with the fuel supplier. The San Pedro Sun confirmed that the fuel bill at Caribeña Fuels, consumed by the San Pedro Police Department is in the thousands of dollars and as a result the fuel supplier was forced to cut supply to the police force on the island. In briefing the press this morning, representatives of Caribeña Fuels confirmed that indeed the supply was suspended. According to the representatives of the fuel company, the situation is a long time problem and the police have not been able to maintain their accounts with the company. In the past, Caribeña Fuels has allowed ample time for the account to be cleared, but because of the economic conditions, the fuel company says that they are unable to allow anyone with longstanding bill, which includes the San Pedro Police Department, to operate a delinquent fuel account. Caribeña Fuels insists that they have attempted various avenues, including dialoguing with representatives of the San Pedro Police Department to no avail. The question remains, how has the Police department continued to operate without fuel from its supplier? The Head of the Coastal Executive Unit, Assistant Superintend of Police Mr. Dennis Arnold says that it has been through the generous support of the business community in San Pedro. However, Arnold refused to comment on the suspension of fuel supply by the supplier. "we are well aware that the suspension of the account may cause serious inconvenience to the general public," and added "however, we don't understand why is it that it does not bother the Police Department to attempt to work with Caribeña to alleviate this situation." While the Police assured us that the services of the Police Department remain uninterrupted, it is a public concern. For its part, Caribeña Fuels says that as soon as the bill is cleared, the company will reopen the Police's account because they realize and understand the importance of the service to the community. Police Press Officer Sergeant Fitzroy Yearwood in a telephone interview informed The Sun that two checks have been prepared, one dated January 17th and the other dated January 24th. According to Yearwood with both checks totaling the amount which was owed to the supplier, their accounts are current.